Asahi Seiki STP-45 2.5” Stroke 12 Station Die Set New 1994 Transfer Press 40-140 Spm! This press is guided on 6 sliding surfaces. 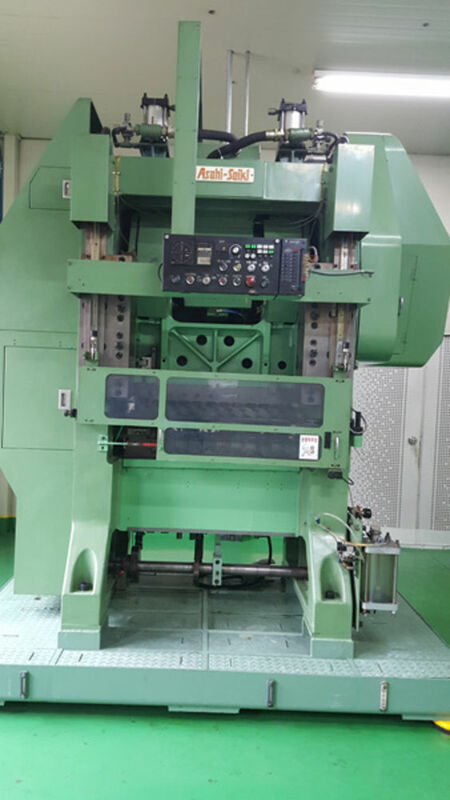 It is a box frame ram type machine where it is guided at each corner. The ram on this machine is not like the regular transfer press which is a flat thick casting with 4 sliding surfaces. This ram is a box casting that is more like a conventional straight side press and provides much more rigidity and accuracy. This press is made for more difficult transfer press work that would benefit from more ram guidance. • Straight side frame for high rigidity. STP is a straight side transfer press with high rigidity, realizing exceptional accuracy at lower dwell Casting iron slide with 6-surface guide for high rigidity Slide with 6-surface guide minimizes accuracy variation and improves the workpiece preciseness.